Trackless Choo Choo Train – One of Celebration Authority’s most exciting and attractive rental items, the Trackless Choo Choo train is a guest favorite! Rent the choo choo train to transport guests from remote parking to your event site, or create a special scenic route for riders to enjoy. The excellent value, incredible appearance, exciting ride and plentiful room, make this a standout amusement. Our trackless outdoor train, complete with driver, engine, three double-seated cars and a roof, is the epitome of excellence! Every guest is sure to love taking a ride on this wonderful, colorful train. 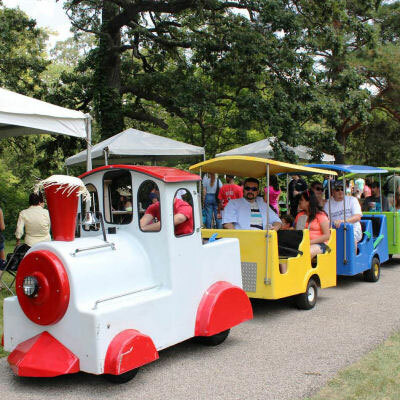 Celebration Authority’s Trackless Choo Choo Train is a pro quality Amusement Rental, perfect for Picnics, Festivals, Outdoor events, Indoor Events, Family Reunions, Birthday Parties, Carnivals, Block Parties, Corporate Events, School Events and much more!